ROLLING HILLS ESTATES, Calif. – Displaying a strong finishing kick, four players broke par to help No. 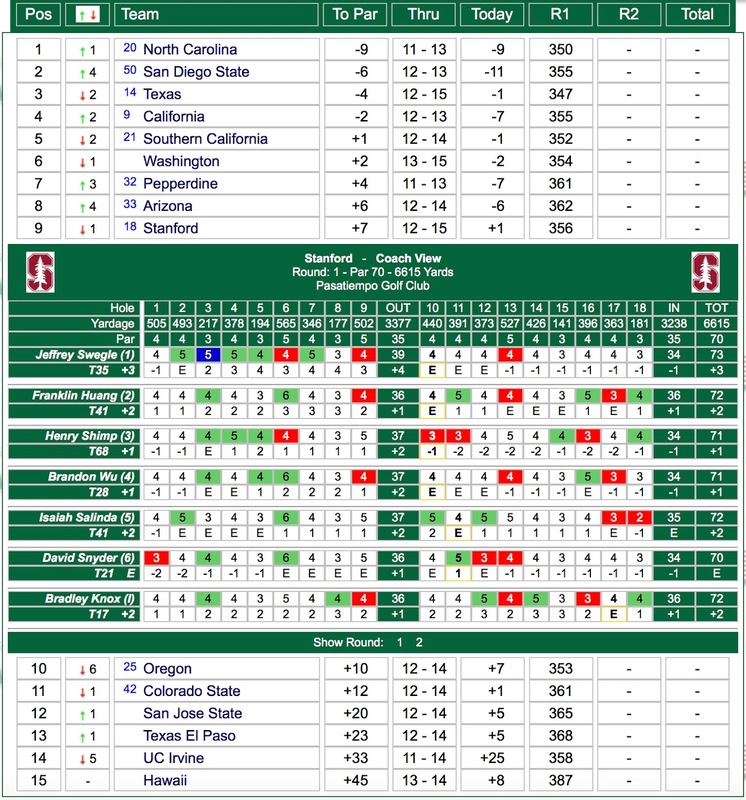 12 Stanford finish fourth Wednesday at the 59th Annual Pac-12 Conference Championships. The Cardinal combined for a score of 8-under 348 -- tied for second-best on the day – to wind up at 18-under 1,402 in the 12-team, 72-hole regular season finale at Rolling Hills Country Club. Host USC posted a wire-to-wire win at 31-under 1,389, four shots ahead of Colorado (1,393). "Proud of how the guys bounced back and everyone shot around par or better," said Conrad Ray, the Knowles Family Director of Men's Golf. "The course got harder and faster each day, so we had a solid day with the conditions." 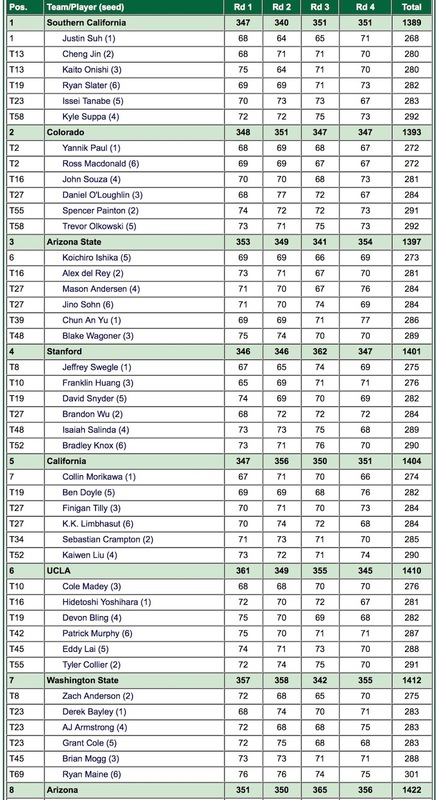 Senior Jeffrey Swegle paced Stanford with a tie for eighth. He shot rounds of 67-65-74-69 to conclude at 10-under 275. On Wednesday, Swegle holed a sand wedge for eagle at the par-4 eighth and also drove two short par-4s, adding three birdies. Senior Franklin Huang registered his third top 10 of the season by tying for 10th at 7-under 277 (65-69-71-72). Sophomore David Snyder (74-69-70-69) recorded a career-best tie for 19th (74-69-70-69) with a score of 2-under 282, carding birdies on three of his last four holes Wednesday. Junior Brandon Wu (68-72-72-72) was steady all week and tied for 27th at 1-over 284, while junior Isaiah Salinda saved his best for last, closing with a 3-under 68. He forged five birdies and only one bogey to earn a share of 48th at 5-over 289. Senior Bradley Knox also turned in his best performance of the tournament with a 70 and tied for 52nd at 6-over 290. Justin Suh of USC captured medalist honors with a score of 16-under 268, with four players sharing second at 272. Stanford now awaits word on the NCAA Regionals, May 14-16. Teams and sites will be announced on the Golf Channel next Wednesday at 2:30 p.m. PT. All are shooting for spots in the NCAA Championships, May 24-29 at Karsten Creek Golf Club in Stillwater, Oklahoma. "We've got some good, positive momentum," Ray said. "Excited to hear about our next assignment." 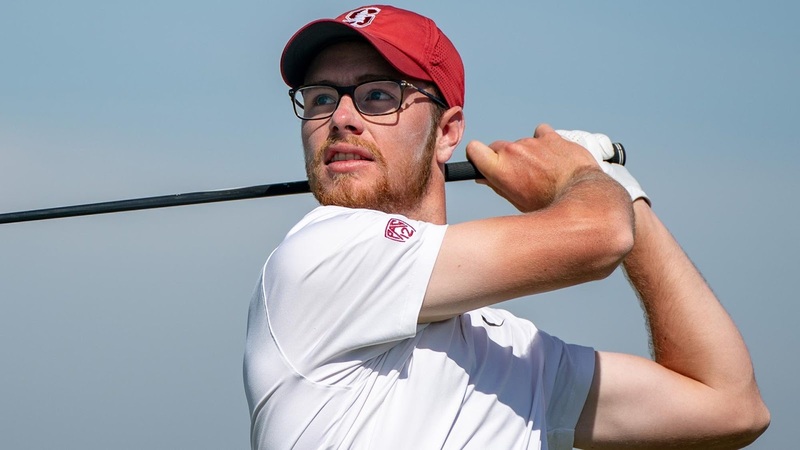 Stanford lost ground and looks to make it up Wednesday in the final round of 59th Pac-12 Championships at Rolling Hills Country Club near Los Angeles. After opening with 9-under totals of 346, the third round was a struggle, as the Cardinal compiled a 7-over 362. 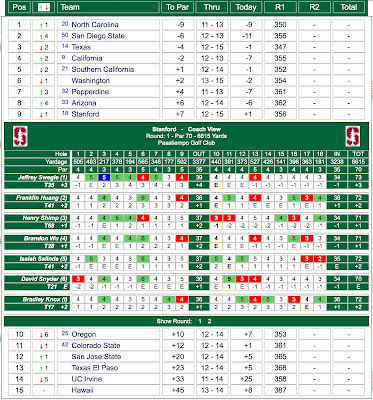 Stanford slipped from second to fifth with a 54-hole score of 11-under 1,054. 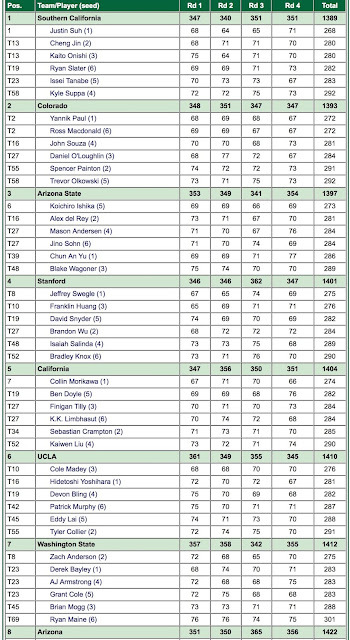 Host USC continues to set a torrid pace at 27-under 1,038, five strokes ahead of Arizona State (-22). 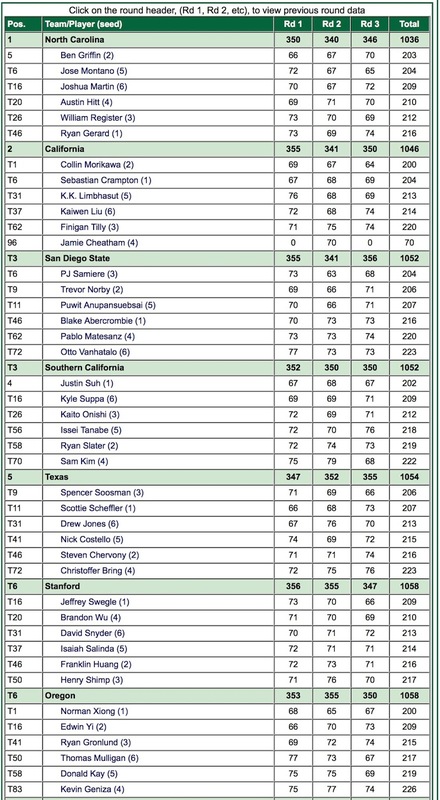 The Cardinal is eight strokes out of third place. Seniors Franklin Huang and Jeffrey Swegle remained in the top 10 individually. Huang made three birdies and three bogeys on the links-style layout to post an even-par 71 and is tied for fourth at 8-under 205. Swegle (75) is a shot back at 206 and knotted for ninth. 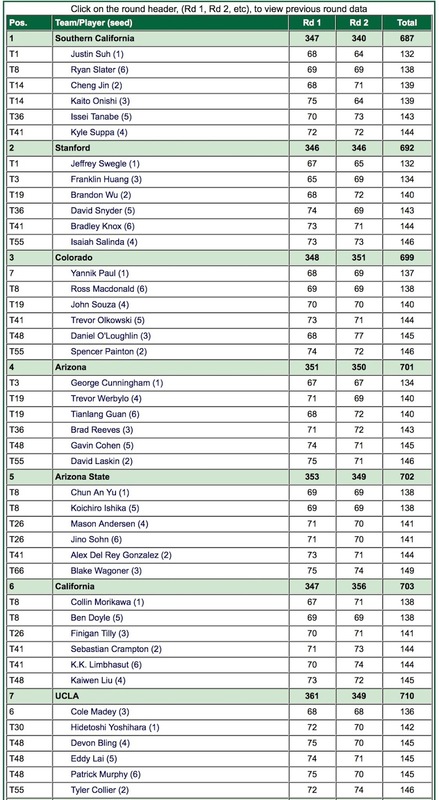 Junior Brandon Wu (72) has a share of 24th at 1-under 212, while sophomore David Snydernotched the team's best round with 1-under 70 and is tied for 28th at even par 213. Senior Bradley Knox (76) is at 7-over at 220, followed by junior Isaish Salinda (75) at 221. Justin Suh of USC leads in the medalist race with a three-round score of 16-under 197, six shots in front of George Cunningham of Arizona (203). Below are the first 3 round standings and individual scoring for the top 8 teams - click on image to enlarge. 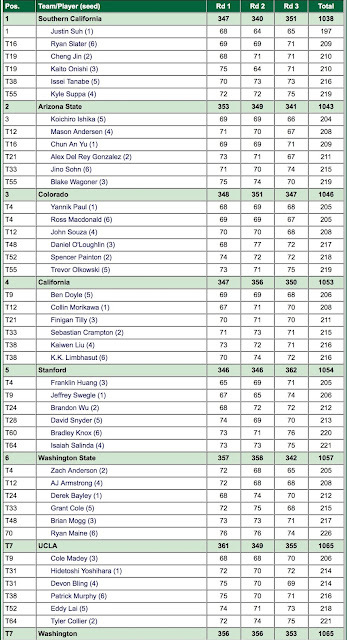 Three players posted 36-hole sub-par totals Monday to lift the 12th-ranked Stanford men's golf team into second place after two rounds of the 59th Pac-12 Championships at Rolling Hills Country Club in southern California. Counting the best five out of six scores, the Cardinal tallied a pair of 9-under 346's to finish at 18-under 692. Host USC holds the lead at 23-under 687 (347-340). Senior Jeffrey Swegle led the way with rounds of 67-65 to conclude at 10-under 132 and shares the individual top spot with Justin Suh (68-64) of USC. Senior Franklin Huang (65-69) is tied for third at 8-under 134, and junior Brandon Wu (68-72) secured a share of 19th at 2-under 140. Swegle, coming off two consecutive strong showings, collected six birdies in the morning and seven in the afternoon. Huang shot a bogey-free 6-under 65 in the morning, blitzing the back nine in 5-under 31, and fashioned 10 birdies on the day. Stanford starts third round play Tuesday at 9 a.m. PT. The final round will be contested Wednesday. SANTA CRUZ, Calif. – Stanford posted the second-best final round on Sunday to earn a share of sixth place with Oregon in the 72nd Annual Western Intercollegiate at Pasatiempo Golf Club. The No. 18 Cardinal tallied a score of 3-under 347 to finish at 8-over 1,058 in the 15-team, 54-hole tournament. North Carolina closed with 346 to capture the team championship at 14-under 1,036. "Proud of the guys that we were able to shoot one of the lowest team rounds of the day," said Conrad Ray, the Knowles Family Director of Golf. Prior to starting the third round on Sunday, players had to complete the second round, which was suspended Saturday evening due to darkness. 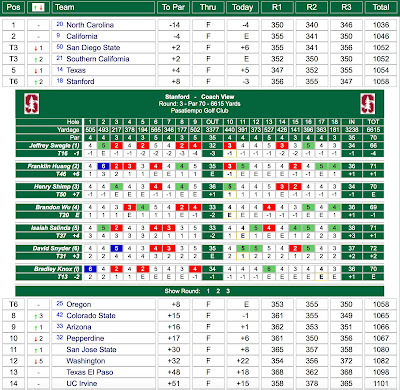 Stanford started the final round in eighth place. Teeing off on the back nine, the Cardinal racked up birdies to make a move and maintained the strong play on the front side. For the second consecutive event, senior Jeffrey Swegle paced the squad with a 4-under 66 and tied for 16th at 1-under 209. Last week, he recorded a career-best runner-up showing at The Goodwin at TPC Harding Park Golf Course in San Francisco. On Sunday, Swegle chalked up six birdies, making three straight on holes 8-9-10 - see the team's final round scorecards below. Brandon Wu fired a 69 to tie for 20th at even-par 210, while David Snyder (72) tied for 31st at 3-over 213. Isaiah Salinda (71) earned a share of 37th at 4-over 214; Franklin Huang (71) tied for 46th at 6-over 216; and Henry Shimp (70) tied for 50th at 7-over 217. Senior Bradley Knox (70), competing as an individual, produced Stanford's highest finish by tying for 13th at 2-under 208. Last year, he tied for fifth at the Western. Norman Xiong of Oregon backed up last week's win at The Goodwin by claiming medalist honors in a playoff against George Cunningham of Arizona and Collin Morikawa of Cal. All finished at 10-under 200. Stanford concludes the regular season on April 23-25 at the Pac-12 Championships at Rolling Hills Country Club in Los Angeles. "We will need to work on our putting," Ray said. "But I think we are still in a good spot and building the right way." 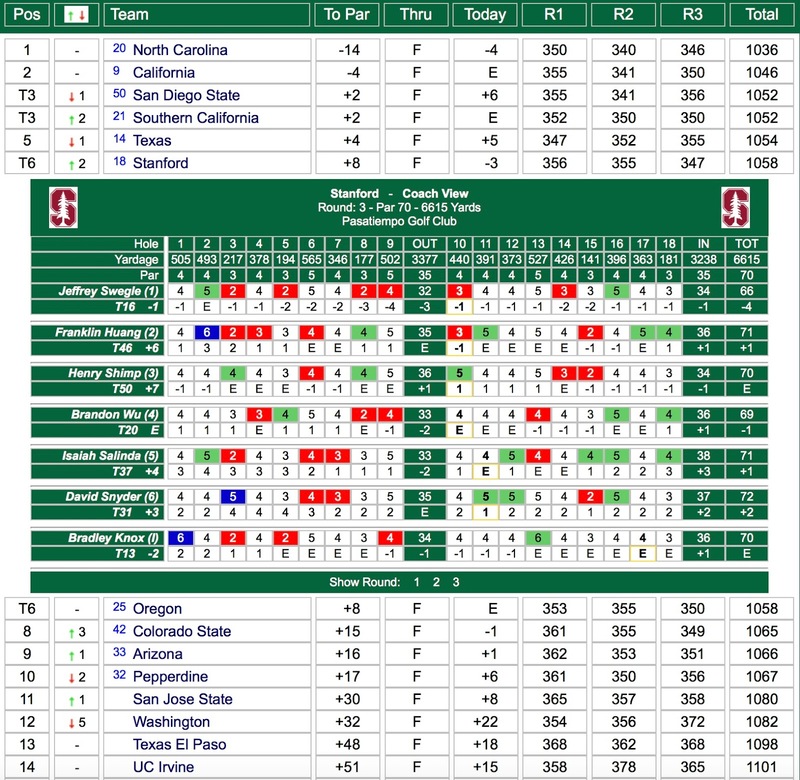 SANTA CRUZ, Calif. – The Stanford men's golf team sits ninth midway through the second round of the 72nd Annual Western Intercollegiate at Pasatiempo Golf Club. On Saturday, play was delayed 90 minutes due to heavy overnight rain. As a result, the 15-team field was unable to complete the scheduled 36 holes before play was suspended by darkness. The second round will resume at 8:30 a.m. PT. Immediately afterward, the final round will begin and there will be no repairing. North Carolina is the current leader at 9-under, while Stanford is 7-over. George Cunningham of Arizona and Scottie Scheffler of Texas share the individual lead at 7-under. In first round play, the Cardinal combined for a score of 6-over 356 and was in the eighth place, nine strokes behind frontrunner Texas (347). 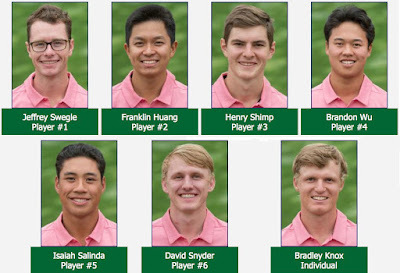 David Snyder paced Stanford with an even-par 70, followed by Henry Shimp and Brandon Wu with 71s, Isaiah Salinda and Franklin Huang with 72s and Jeffrey Swegle with a 73. Competing as an individual, Bradley Knox shot 72. All Cardinal players have completed at least 12 holes in the second round. Knox (-3) is tied for 17th, Snyder (even) is tied for 21st, Wu (+1) is tied for 28th, Swegle (-1) is tied for 35th, Salinda (+1) and Huang (+1) are tied for 41st, and Shimp (+6) is tied for 68th. Coming off a strong third-place showing at The Goodwin, No. 18 Stanford looks to continue the positive momentum this weekend in the 72nd Annual Western Intercollegiate at Pasatiempo Golf Club in Santa Cruz, California. Fifteen teams will compete in one of the oldest collegiate tournaments in the country. The 54-hole event features 36 holes on Saturday and 18 on Sunday. "It's a phenomenal golf course," said Conrad Ray, the Knowles Family Director of Men's Golf. "It's an exercise in who can keep the ball below the hole and hit it in the fairway. It's just a great test of golf." Last year, the Cardinal (+18) finished second to USC (E). Senior Maverick McNealy, the 2016 medalist, led the way with a fourth-place finish. 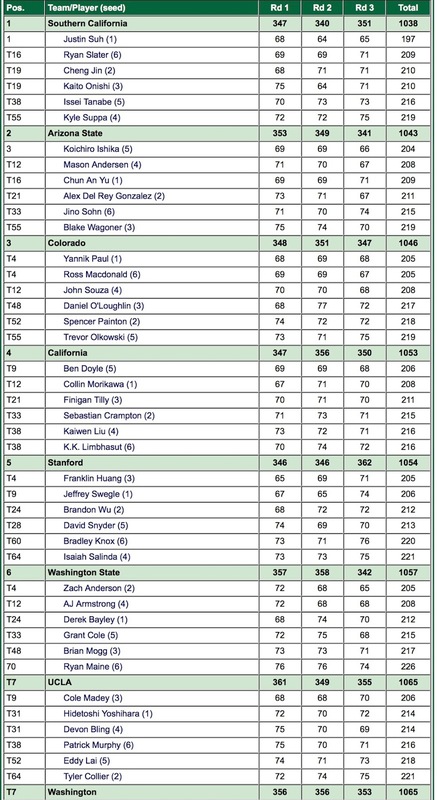 Stanford also received strong performances from Isaiah Salinda (t-5), Franklin Huang (t-24), Brandon Wu (t-44) and Jeffrey Swegle (t-47). "We've had some great success there through the years," Ray said. "It's treated us well. Hopefully, last week was something we can build on and more to come." All but McNealy, now playing professionally, will return this weekend. They will be joined by sophomore Henry Shimp. Swegle, a senior, earned a career-best second-place showing at The Goodwin. He fired an 8-under 63 in the second round at TPC Harding Park in San Francisco, equaling the fifth-lowest score in program history. 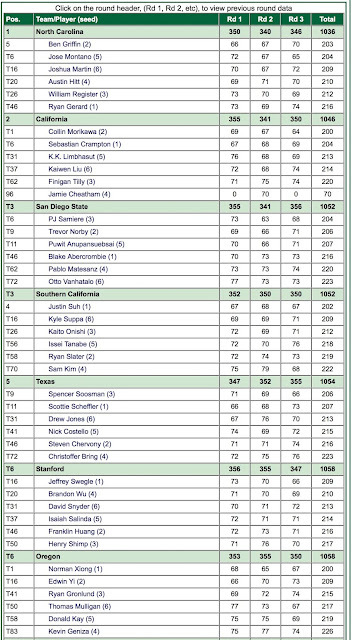 Pasatiempo Golf Club, Santa Cruz, Calif.
• The 15-team field is comprised of Arizona (33), Cal (9), Colorado State (42), Hawaii (240), North Carolina (20), Oregon (25), Pepperdine (32), San Diego State (50), San Jose State (103), USC (21), Stanford (18), Texas (14), UC Irvine (128), UTEP (80) and Washington (66). • 54 holes, stroke play, counting top five of six scores each round. The field will play 36 holes on Saturday and 18 on Sunday. • 8:30 a.m. PT shotgun start each day. Stanford and Texas will play together the first two rounds and start on #10 and #11. New pairings will be made Sunday based on team scores. • Jeffrey Swegle, Franklin Huang, Henry Shimp, Brandon Wu, Isaiah Salinda and David Snyder. • Designed by 1921 U.S. Women's Amateur champion Marion Hollins and legendary English architect Alister MacKenizie, whose masterpieces include Augusta National and Cypress Point Club, this sprawling layout opened in 1929 and features elevation changes, side-hill lies, strategically-placed bunkers, winding valleys, tight, tree-lined fairways, contoured greens and spectacular views of Monterey Bay. MacKenzie considered the course his finest creation and owned a home adjacent to the sixth fairway. Following his death in 1934, his ashes were spread around the course. The great Bobby Jones played in the first group to play the course. Pasatiempp has long been ranked among the top 100 courses in the U.S.